Just over a week ago a devastating terror attack on Sikh leaders in Afghanistan sent shockwaves around the world, highlight the precarious situation of religious minorities in Afghanistan. The attack has also galvanised Sikhs in Canada. In particular, Sikh groups are asking why the Liberal government is not doing more to accept Sikh and Hindu Afghan refugees into the country. Some also wonder why Canadian Sikh MPs aren’t raising their voice. As one prominent activist (who wanted to remain anonymous) put it: "4 Sikh Ministers, 15 Sikh MPs, 1 Sikh leader. 0 Afghan Sikh refugees." There is little doubt that religious minorities in Afghanistan face persecution. "In the 70s, there were around 700,000 Hindus and Sikhs, and now they are estimated to be less than 7,000," says Ehsan Shayegan, an Afghan researcher with Porsesh Research and Studies Organization, in Kabul. Others say their numbers are even fewer. "It is estimated that Hindus and Sikhs make up around 3,000 Afghans scattered across provinces of Kabul, Nangarhar and Ghazni," says Rawail Singh, an Afghan Sikh civil rights activist. He told Al Jazeera the worst started after the US-backed Mujahadeen militias fought for control after the Soviet-backed government fell in the 90s. "We were harassed, our lands were forcefully taken, we were persecuted and even killed for even slightest display of our faith. Kidnappings of Hindus and Sikhs were rampant." Decades of upheaval and chaos in Afghanistan has made the situation worse. Many Hindu and Sikh families migrated to India, or to western countries such as the UK and US. But some of those who went to India returned after difficulties making a living. Giving refuge to Afghani minorities in Canada had become the personal mission of Manmeet Singh Bhullar, a Member of the Legislative Assembly of Alberta for Calgary-Greenway. He died in a tragic accident in 2015 but others are taking on that legacy. The World Sikh Organization of Canada says that due to Manmeet Singh Bhullar's work, over 200 Afghan Sikh refugees in India are awaiting approval of sponsorship applications to Canada. But the Liberal government has been largely silent on the matter. There has been no indication when the asylum applications will be approved. On Saturday evening, 7th July, the Ontario Gurdwara Committees (OGC), Ontario Sikhs and Gurdwaras Council (OSGC), World Sikh Organization (WSO), Khalsa Aid and the Bhullar family held a joint press conference. The press event at Sri Guru Singh Sabha in Malton, Ontario, was organised to address the plight of Afghani Sikhs and Hindus. A joint statement urged the Candian government to expedite the processing of current Afghan Sikh refugees in India, and recognize Afghan Sikhs and Hindus as vulnerable minorities. It also called on the Canadian government to create a program to bring Afghan refugees directly into Canada. On Twitter the World Sikh Organization has also been rallying supporters to call their representatives, and explaining what they’re doing. So far, Liberal ministers and MPs have spoken out in defence of Afghani minorities. Defense Minister Harjit Sajjan tweeted: "Senseless act of terror targeting Sikhs and Hindus in Eastern Afghanistan. My thoughts and prayers are with the victims and their families." But Liberal MPs have largely resisted in calling their own government to go further. A statement from the NDP, endorsed by leader Jagmeet Singh, said: "All religious minorities should be free to worship and live in peace. I call on the government to speak out forcefully in defence of all religious minorities in Afghanistan." Notably, only his brother Gurrattan Singh went further, adding: "Canada must do more to ensure these communities have a permanent solution for their safety." But the NDP has yet to put serious pressure on the Liberals to do more. Canadian Sikh groups are hoping, for now, that they won't have to and Liberals will listen. "In previous years, asylum has been granted to a number of Syrian refugees. We request the government shows similar compassion to the Sikhs and other minorities from Afghanistan," said Mejindarpal Kaur, International Legal Director at United Sikhs, which is also pushing for the Canadian government to do more. Barfi Culture has reached out to the Immigration Minister Ahmed Hussan's office and asked what the Liberal government is doing to help Afghan refugees. We have not yet received a reply. 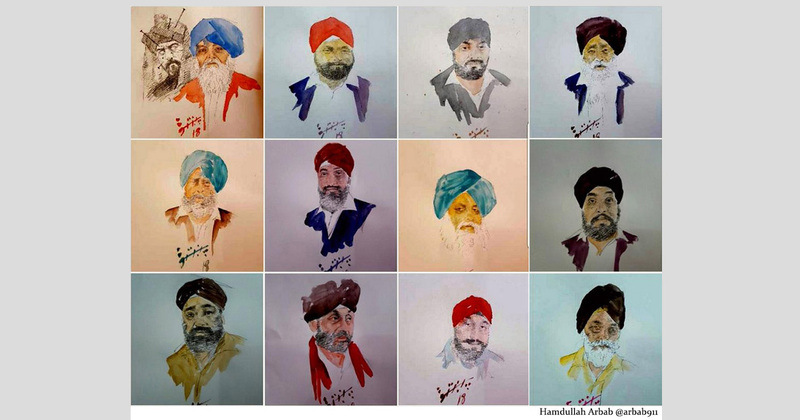 The picture above are illustrations by the Afghan artist Hamdullah Arbab - on the Afghan Sikh victims.